Matangi mudra is useful to attain inner harmony.Practicing this mudra helps you to achieve peace with your inner self and with the surroundings.Doing this mudra while meditation will give instant results. 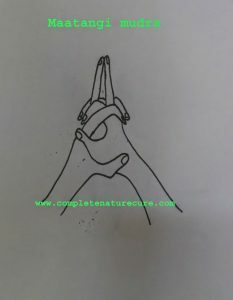 If you have any tension or anxiety then do this mudra for a while to get relief. This mudra is formed by interlocking the hands and keeping the middle fingers straight and touching each other like in the picture. Matangi mudrā directly affects the hypothalamus. Benefits and healing properties of Matangi mudra. The hypothalamus is the primary autonomous part of the nervous system; This mudra helps to establish a state of balance in the body. This the best mudra to relieve tension. 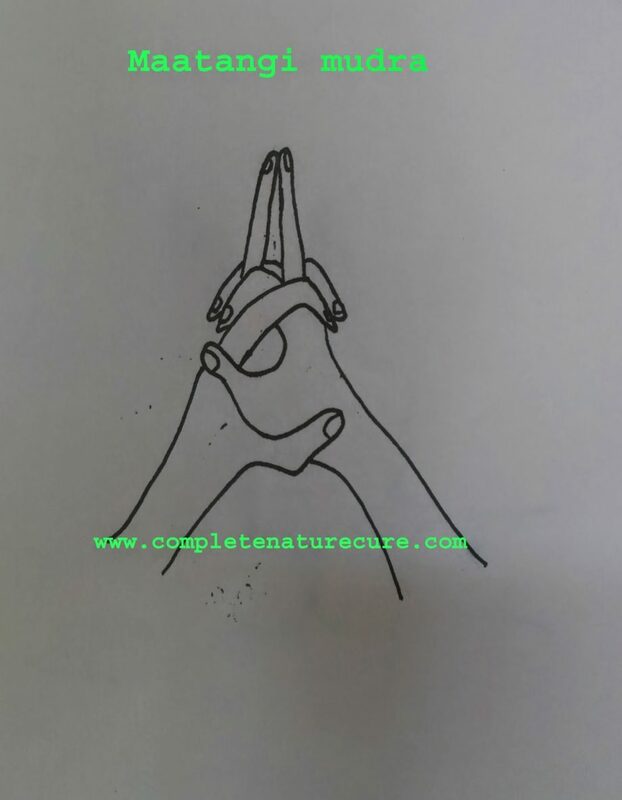 Matangi mudra is very effective in relieving the pains in the organs of chest and abdomen. 20 minutes of practice is enough to get instant relief from pains and 5 minutes each in the morning and evening to get internal harmony. There are no side effects for this mudra and also no precautions. This Mudra can be performed by anyone or anytime. How to do Matangi yoga mudra: Draw water through the nostrils but throw it out through the mouth. While throwing the water through the mouth, give the mouth a tube-like shape and let the water gush forth forcible. Benefits: Matangini yoga mudra tones the optical nerves and the brain. It removes a headache, prevents cold, adds luster to the face and leads to peace of mind.